A MiniGame is an engaging, short-term activity designed to pursue an opportunity or correct a weakness within a company. MiniGames have a theme and are meant to be fun and engaging. Like other games, they should have a goal, a defined time frame, a scoreboard, and a prize. These activities are meant to produce day-to-day improvements that add up to long-term success. MiniGames should engage employees through incentives and friendly competition. Challenging employees in this way not only helps the company make progress toward its goals, it creates an opportunity to develop staff, improve teamwork, and increase employee satisfaction. General goal: A general goal outlines the outcome you would like to achieve. For example, a general goal might be to increase sales. Specific target: A specific target needs to be high enough to make an impact but achievable within the given timeframe. A target example using the above goal might be to get 10 new customers. Time frame: The time frame indicates when the game ends and when results will be measured. For example, a timeframe for getting 10 new customers could be 90 days. Two to six months is a good timeframe for most MiniGames. Players: Who will be involved in the game? For larger companies, it could be just one department. With smaller companies, it is easier to involve everyone. Scoreboard: The scoreboard used in a MiniGame should be something fun, creative, and visual that enables everyone to see the progress being made. Reward: We suggest using something non-monetary that is fun and reinforces the idea of shared success. For example, you could reward players with a catered barbeque or a “movie day” at work. Initiate change: One of the main reasons to coordinate a MiniGame is to further the success of the business by improving key performance metrics. MiniGames help companies do this by focusing on an operational or financial number that represents a weakness or an opportunity. Teams are challenged to find solutions to these problems or to brainstorm unique ways of taking advantage of opportunities. 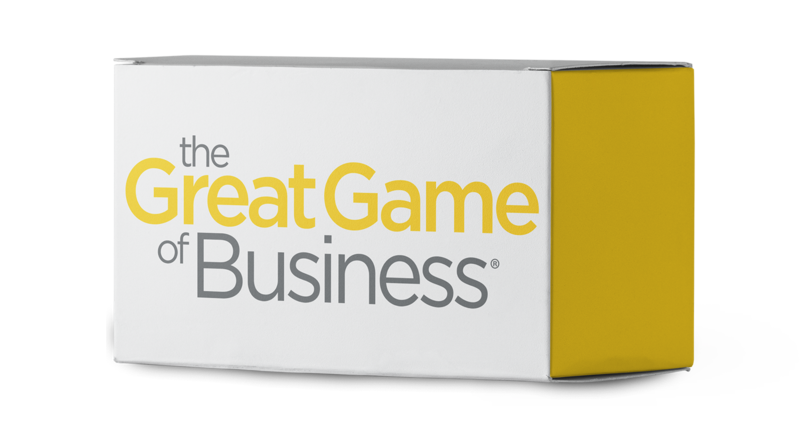 Reinforce business education: One of the core principles of The Great Game of Business is to “build a business of business people.” MiniGames are a microcosm of The Great Game in that they reinforce key components of success, including goal setting, mutual responsibility, and performance management. These short-term games teach players to track, measure, and report progress and give a more thorough understanding of how their individual efforts contribute to organizational success. Build teamwork: The best way to strengthen a team and help its members bond is to rally around a common goal. MiniGames provide players an opportunity to bring their unique talents and skills to bear on a shared challenge with the desire to support the team, providing powerful motivation. Create a culture of winning: Playing regular MiniGames that highlight and celebrate successes creates an environment and a culture focused on winning. Keep it simple: When MiniGames are too complicated, it makes it difficult for employees to understand how their actions can drive results. This can have a negative impact on engagement. Keep everyone’s eyes on the end goal: By keeping the focus on the end goal and not just the prizes, the context of the team’s efforts can be realized within the organization’s bigger picture. Make it fun: Games are suppose to be fun and feel like a change of pace from regular work. Find ways to make MiniGames entertaining and refreshing for participants. Don’t be afraid to make changes: Try to continually enhance and improve upon gameplay. Don’t be afraid to make changes (even in the middle of a game, if necessary) if some aspect of a MiniGame isn’t working as expected. Keep employees informed: Have a strategy for keeping everyone informed about the progress of the MiniGame. Share performance updates through emails, team huddles, and company/department meetings to keep everyone engaged. Anderson Precision, a Great Game practitioner since June 2017, has conducted 15 MiniGames, which have saved the company an estimated $500,000 annually. One particularly successful MiniGame was called “Lock and Load.” It was focused on improving utilization of a $320,000 CNC machine. The game taught employees processes they could use to increase the return on this significant investment. For those of us playing The Great Game of Business, our goal is to improve the financial literacy of our employees and increase our company’s performance—and ultimately its value. MiniGames can be a powerful tool, whether times are good or bad, because they create a positive environment and enthusiasm about making progress toward a shared goal.